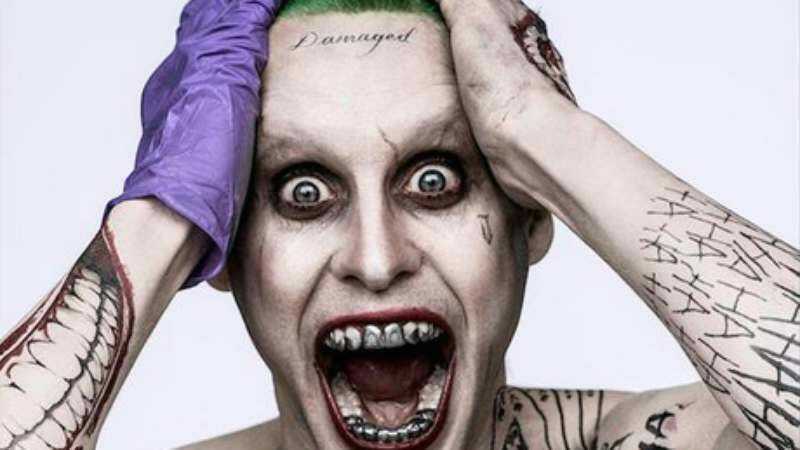 Last night, Suicide Squad director David Ayer tweeted the first clear look at Jared Leto as the Joker. It’s a dramatically different take on the character that should please those who have long found this psychotic clown too subtle. Heath Ledger’s Joker famously asked, “Do you want to know how I got these scars?”—only hinting at a deep inner torment, as one of his character’s greatest weaknesses was his frustrating refusal to open up. Finally, this Joker has the word “Damaged” tattooed right on his forehead, so we don’t even have to wonder about his feelings, or what happened to make him this way. He fell into a toxic vat filled with Marilyn Manson CDs and anger at his boss. He got those scars because he cut himself on the world. Together, they worked out various other motifs related to himself— a little “J” under his eye, some traditional playing cards, a cool jester skull the Joker just picked off the wall—and finished off with words across his stomach we can’t quite read, but we’ll just assume say, “CLOWN LIFE,” because he is totally down to clown. We’ll also just assume the Joker signs up with the Suicide Squad because he’s saving for an epic back-piece. “You’ll need to apply Bactine every few hours to make sure these all heal nice and clean,” the tattoo artist told him. So the Joker diligently worked that into his daily routine of pull-ups and shaving his armpits. The Joker wouldn’t want things to get messy. Anyway, there are a lot of other details to take in here—the single purple glove, the gaudy pinky ring, the steel grill—but luckily you can just sort of do that all at once now, because this Joker is definitely in your face. Finally, an insane clown that doesn’t require parsing quite so much nuance.